We are more than just name badges. Expect personal, knowledgeable expert service with every order. Patriotic Holidays and events are a great way to reach out to potential clients in your community. It's no secret that Americans and the American housing market are in the midst of historically challenging and changing economic times. Now more than ever Realtors® need to find ways to reach out with good advice and realistic optimism to help move our housing market and our country in the right direction. Are you planning to attend your local June 14th flag day events or 4th of July parade and events? With so many buyers out there this summer why sit on the sidelines and do nothing? Now more than ever you should be doing everything you can to stay in front of potential customers. DON'T MISS OUT! ORDER YOUR HAND HELD FLAGS TODAY! These flags are an affordable symbol of pride and American values. They’re the perfect way to get your name into the hands and the eyes of the public. Made of traditional colorfast cotton, our American flags resist fading and ensure a vibrancy of color for years to come. Your imprint appears on the wooden staff. Our Hand Held flags come in a variety of sizes and are printed in vibrant colors on extra heavy cotton material, securely stapled to smooth-sanded wooden staffs with gilded spearheads. Attend your local Memorial Day, Flag Day or 4th of July Parade/Event and hand out flags to the crowd. "No Brainer!" Place flags on doors & mailboxes throughout the neighborhoods you are farming. Leave flags at local elementary schools for children to bring home to their parents. Why not also give them a copy of the US constitution for them to read as a extra gift. Coordinate with your local Boy Scout and Girl Scout troops and let them help you to hand out flags at parades, in neighborhoods or even in front of your local grocery stores! These flags are also ideal for political event giveaways such as victory parties, rallies, door to door political campaigning, etc. You can also order flags without an imprint for as low as .30 cents each which is a fantastic price. Use our non-imprinted flags in concert with printed/perforated cards to make an impact in your farming areas. Simply create your "Compliments Of" card with a hole at the top and bottom, then affix your card using tape, glue, staples or you can also cut out card slots. CLICK HERE to download a FREE & EASY online PDF "Compliments of" card that you can print on your own printer, cut and utilize. Simply download it, fill in one of the squares and the remaining squares will auto-populate with your information! Next, print out as many as you need, cut the paper and then poke the flags through. If you would like to make it even easier on yourself, simply visit your local Office Depot, Office Max, or Wal Mart and pick up some AVERY Postcards for Inkjet Printers. Product Number (#08387). Print out how many postcards you require and poke the flags through! The only thing easier than that is to buy your flags with your information already printed on the staff! The following are not laws; they are examples of courteous flag etiquette. Fly a U.S. flag above all other lesser flags on a flagpole. Never Fly the U.S. flag with a flag from another country on the same pole. An upside-down flag is a sign of distress. A flag at half-mast is a sign of mourning. 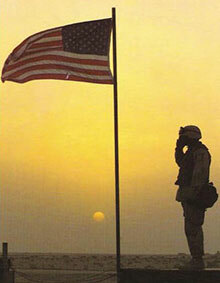 When raising or lowering a flag half-mast, first raise the flag to the top of the flagpole. It is unacceptable to lower a flag over a casket into a grave. It is acceptable to display a flag at night if it is properly illuminated. The blue portion of the flag will be visible on a properly folded flag. Give a flag that's beyond repair to your local American Legion Post - they will dispose of it properly. The History: The Continental Congress adopted the Stars and Stripes pattern for the national flag in 1777, almost one year after the Declaration of Independence and more than a decade before the U.S. Constitution was finalized. Flag Day was first celebrated in 1877, the centennial of the U.S. Flag’s existence. After that, many citizens and organizations advocated the adoption of a national day of commemoration for the U.S. Flag. It was not until 1949 that President Harry Truman signed legislation making Flag Day a day of national observance. Stars and Stripes: The U.S. Flag has thirteen horizontal stripes, alternating red and white, each strip representing one of the 13 original colonies of England. The United States Flag has 50 stars, one for each state of the Union. The last star added was for the state of Hawaii, in 1960. Marching with the Flag: Famed composer and long time U.S. Marine Corps. Bandmaster John Philip Sousa wrote the stirring march, “Stars and Stripes Forever”. Flag Photographs: One of the most famous images from WW II is the photograph snapped by Associated Press photographer Joe Rosenthal showing the second raising of the U.S. Flag by U.S. Marines, February 23, 1945 on Mount Suribachi, Iwo Jima Island. Don't let them forget: Sadly, Flag Day is not a recognized holiday in the United States! Although it is marked on calendars, for most Americans the day passes without knowledge of the significance of the date. Handing out flags door to door in your neighborhood with a Flag Day message on a card is an excellent way to keep Flag Day in the minds and hearts of Americans and also help to cement yourself as a patriotic American real estate professional. You should place your order 2-4 weeks before the event.. Imprinting Set-Up Charges: $50 set-up charge. Price Includes 1-color imprint on staff. For Imprinted U.S. Flags please allow 3 to 4 weeks for production and delivery. or you can always call us toll free at (800) 457-7030. If you would like to take advantage please use the form below and start receiving a monthly discount full of savings, great ideas and suggestions. © 2013 Recognition Express All rights reserved. Greetings from the Recognition Express eCommerce development team in Las Vegas, Nevada!